I am finally getting back into the swing of things after being in Chicago for 6 days last week. Deb and I had a great time at our new home, Idea-ology (because really, if you have seen the Idea-ology booth, you want to live there). Thank you to Tim and Mario for the fabulous CHA experience! We felt "at home" and you can't ask for more than that, really just perfect. Everyone at Advantus, Ranger, Sizzix and Stampers Anonymous was also so very nice and welcoming. So glad to re-connect with friends at the show and meet many new faces that I know we will see again. Part of the CHA experience was participating in a retailer event where we learned about new products from the companies I listed above. Most products will arrive at your local retailer in about 8 to 10 weeks, so I thought in the meantime we could test drive some of our favorites to show you what the product does and why we like it (this might be a good time to start a list). I used the Alterations die, Regal Crest to cut out the shapes. Paper is from Paper Stash - Holidays Past. I inked the leaves with the clear side of the pad. Then placed the leaf shape on a piece of paper. 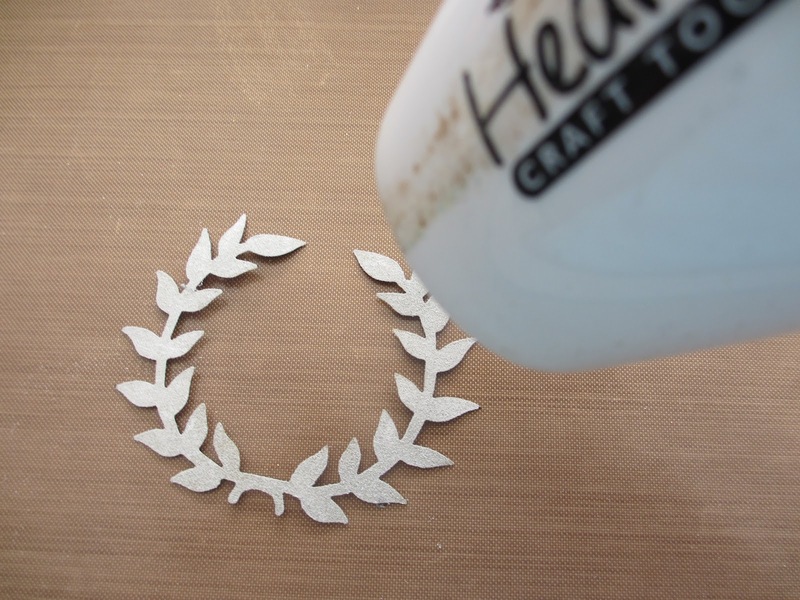 Cover the leaves with Sticky Embossing Powder then tap off, just like regular embossing. Use a Heat Tool to melt the embossing powder. It melts rather fast compared to regular embossing powder. Can you see that it is shiny? When heat embossed, this powder provides a sticky surface for adhering. NOTE: You have about 30-40 second window to add something to the "sticky" surface so my best advice here is to know what you want to add to the sticky surface before you melt the embossing powder. This is the cool part...I added the new Stickles Dry Fine Glitter - Platinum over the top. The glitter sticks to the melted embossing powder (and very well I might add). Again, tap off the excess and slide the extra glitter back into the jar. You could never get these leaves that flat and clean using regular glue. Virtually no clean up, other than sliding the excess glitter back into the jar. I need more pieces to complete the card. So back to the cut out banner. Then I cut out a shape for a background from the new Paper Stash - Holidays Past using the Sizzix Alterations Baroque die. I also cut a piece of black cardstock 5.75 x 9", then folded it in half for the card base. So lets try the Sticky Embossing Powder again with chipboard and foil. then heat with a Heat Tool until shiny. Lay the foil sheet on the chipboard and rub to adhere. Peel away the foil to reveal the silver star. This is just what I was looking for...texture and not too perfect. 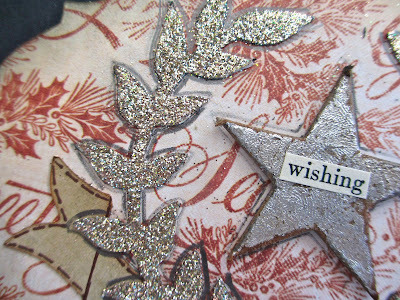 Eventually, I inked up the edges with some Distress Ink - Vintage Photo and added the word wishing. So, time to make the card. I added the Baroque die cutout to the black cardstock then started layering the pieces. I used a soft graphite pencil to add shading around the leaves. The large star was raised with a thin pop dot. I added 3 dots of Adirondack Dimensional Pearls in Cranberry to mimic holly. Once the Dimensional Pearls was dry I had to try stamping with the new embossing powder. So on the inside of the card I stamped stars with the new Stampers Anonymous Christmas Time stamp. 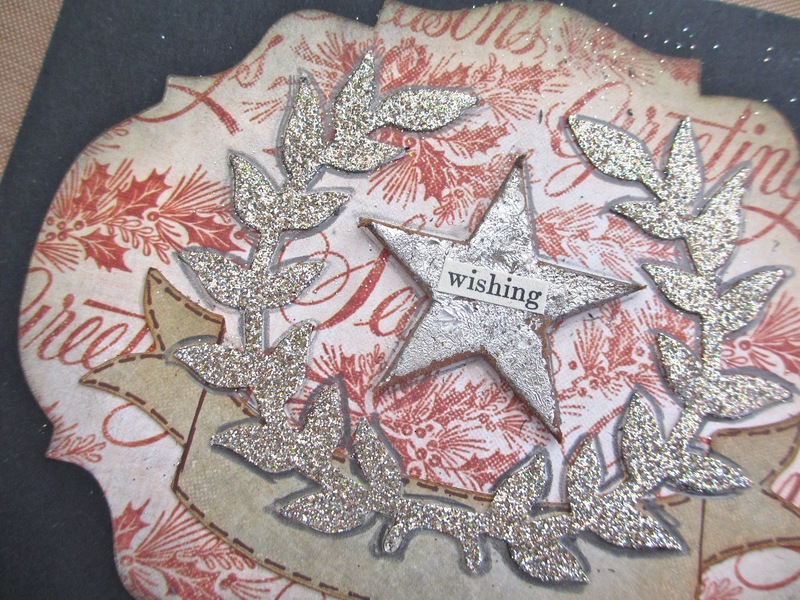 Just follow the same steps to heat the embossed image and add glitter. I used a big fluffy brush to wipe away any leftover glitter particles. I had to take a picture at night just so you can see how lovely the new Platinum glitter is. It looks gold in the jar but it has just the right amount of silver in it. I love the end result...and by the way, it can adhere not only glitter and foil, but micro beads and flocking too. Personally, I would buy the embossing powder just for the fact that the glitter has no glue clean up. Oh, and one more thing before I go...we brought home samples of many of the new products so when you see the posts marked Test Drive...there's gonna be a prize. Hope you will come along for the ride! Leave us a comment for a chance to win the new Stamper Anonymous Christmas Time Stamp, Ranger Stickles Dry Glitter and Sticky Embossing Powder. You have until Friday the 27th at midnight. And remember, most of the new product I talked about today arrives in stores mid-September, just in time for Christmas! This stuff is cool! I am definitely along for the ride, can't wait to see all the things you'll be sharing! Beautiful samples and I can't wait to get my hands on some of that new embossing powder. Lots of ideas running around in my brain! Thanks for sharing. So. Cool. Thanks for the opportunity to win these seriously awesome products!! Beautiful results--love the look of the new glitter! Ooh yeah, Stickles glitter looks like lots of fun & the sticky embossing power making it so easy to use. Gotta love Tim's never ending new ideas. I'm loving all these new products and seeing what you are doing with them. Can't wait to try the sticky embossing powder. ... and ya gotta love the woodlands trees! This stuff looks like a lot of fun! I would love to get my hands on that sticky embossing powder! Wow! I can't wait to get these awesome stamps. I am waiting inpatiently until they come out! I would love to win!! I can't wait to thy this. What a super product - grantees great results. I think I am got to have to start a binder with all your new product tutorials. Glad you are back - we missed you! WOO HOO...so many fab new products!! Can't wait to get my hands on them and start creating!! I think I'm going to really love the Sticky Embossing Powder. I love the way the star turned out. 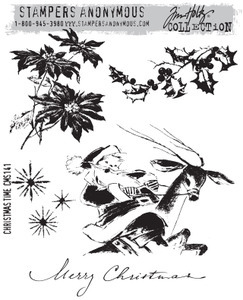 Would love the Stampers Anonymous Christmas set also. I can't wait to get some! i think it's going to make me use glitter even more! Thanks so much for test driving! I love glitter!! I will definitely have to pick up this sticky embossing powder. Thanks for the new tips and tricks! This powder sounds great! I'd love to win the stamps and glitter, too. Thanks for the demo and the chance to win! This is sooo cool, can't wait to try he new embossing powder! Paula . . . LOVE IT, LOVE IT, LOVE IT. great vintage feel, amazing design elements. You're my hero. Sticky embossing powder - what an innovation! Love the card! Thanks for the chance to win. Swoon....sticky embossing powder needs to come to my house! LOL. I'm glad you enjoyed CHA. I can't wait for all the new products to hit the stores. Finally a great solution for my treasured hand done glitter I've purchased from you. I LOVE using it but it's always such a mess. Glad you're liking your new home with Tim. oooohhhhh yes yes yes please - Christmas is my all time fave hol - and this stuff is just the ticket! OMG I am starting a wish list now!! Thank you for the test drive on the embossing powder and the dry fine stickles, I wondered how the stickle glitter would looks and it looks awesome!!! cool! another "must have" product! Wow! I need some sticky embossing powder now! It really looks amazing! So glad your time in Chicago was wonderful! Thanks for the "test" drive. Love the look of the foil star - and all that glitters. It was fun to see photos of you at CHA on Tim's blog - the booth was the most amazing thing I've seen - can't imagine what it was like in person! Love what that sticky embossing powder can do! Can't wait to play with it myself! this is awesome! so many ideas, can't wait to get some from my lss, come on how cool would down feathers be? thx for sharing! First - gorgeous card. Wow! That sticky embossing powder, can't wait to try it. Definitely has the fun factor. Love your card! I would love to test drive these myself! Thanks for the chance to win!! Love, Love, Love this product. I can't wait to try it. Thanks so much for sharing your talent with us! This is a wonderful idea. How easy to get such a great look!! For those of us who were unable to attend CHA in Chicago you have given us some fun insight to some of the new products coming our way!! OH MY!!! THis dry glitter and sticky embossing powder looks so very awesome with the projects you displayed! So GRATEFUL for the demo as I would have wondered if it was worth purchasing these items. THANK YOU!! Thank you so much for sharing the new sticky embossing powder and different techniques! Love all the new things coming our way! Thanks so much for this test drive tutorial. I just came across Sticky Embossing Powder online today and wondered what THAT meant!! Now I can't wait to try it! The card is just beautiful. So glad you and Deb had a great time at CHA! wow, thanks for the tutorial, I am now going to have to have some lol. Wow, very cool stick stuff! Always up for a fun ride! Thanks for test driving the new products. I'm not usually a glitter fan due to the mess but this looks like it might convert me. Love the new goodies!! Sticky embossing powder - who would have thought??!! Thanks for the tutorial and thanks for the chance to win! OhhhhMyGoodness! Now THAT looks like FUN! Can't wait to use the sticky embossing powder. I have all kinds of projects I would love to try. One more goody to play with. Love the sticky embossing Powder. Can't wait to try it! Great sample. I love how all your elements look so awesome together! What a great way to show off these new products! Thanks so much for sharing and for the chance to win! I think I might be in love with that Platinum glitter! Martha Stewart used to have the most perfect color called Antique Silver but now it is discontinued. The Platinum Stickles glitter looks in your photos to be a very close match, so I can't wait to see it in person! I'm intrigued by the sticky embossing powder. Love how you used it on the die cut with the glitter. You better believe I'll be along for the ride. I can't wait to try out the sticky embossing powder (and take it for my own test drive). I'm looking forward to seeing more of your new favorites from the show, and so happy that you had a fabulous experience there! The sticky embossing powder and the dry Stickles sound like they could be so much fun. Can't wait to try them. oh this is fabulous! I have to try it! Love the test drive concept...very clever! Can't wait to try the sticky embossing powder and dry glitter. Thanks for the chance to win such an awesome prize! I love what you did with the foil! Love how it has a real old look and I bet that sticky stuff would be super cool with the multi-colored foils. Love those stars, I would definitely do a happy dance winning all those goodies. Thanks for the test drive. I have some Flocking that has given me fits every time I try to use it...it sounds like this sticky embossing powder will make my life so much easier! I wonder if it will work on the new "Bottle Brush" Christmas Trees...to make mini flocked trees? I love to use gilding flakes so the sticky embossing powder is going to be one product that I can't wait to try. Love all the others too though! I love this sticky embossingpowder! Can't wait to try it out myself. Paula thanks for the step by step with the new sticky embossing powder and the dry stickles glitter. I am so anxious to try these products. Thanks for the chance at the drawing, but more importantly for the demo on how cool they are! when I heard about this stuff on one of the CHA videos someone took of Tim, I mediately emailed my local store to put this on order for me,the possibilities are ENDLESS! Thanks for your step by step post. You are very lucky, Ms. One Lucky Day, to get to play with these new items before the public. I appreciate your letting us know your opinion on these new products. Thanks, and I cannot wait to start playing with all of them! Wow, that seems a lot easier then the other tutorials I've seen about embossing powders. Can't wait to try this out! Thank you for sharing and for giving us a chance to win! Adore your test drive! Brilliant idea...we get to see the new cool stuff in action! Yes this is an embossing powder I will need to acquire! Looks like fun stuff to try! Thanks for the chance to win it! Oh I am in love with this stuff! What a miracle!!!! Can't wait to get my hands on it! Another great demo and project, and that sticking powder is cool!! Love the ideas, and the sticky embossing powder sounds wonderful. Lush stuff indeed, Paula! Of course I am coming along for the ride... Love the foiled effect, always have-- this sticky embossing powder might even be user-friendly enough to convert this glitter-phobe! I will be watching the shops for it. love how the card turned out. thank you for introducing this adnesive product and the opportunity to win! thanks for the demo... love how it removes the messy glue option... can't wait to play. This sticky embossing powder is a must have and can't wait to get my hands on it. Loved your beautiful card. Thank you for a chance to win. ohh,that star is awesome-what kind of foil did you use? Looking forward to trying these out myself. These look interesting. The foil looks like it would be less messy than usung the glue. Wahoo! MORE new products coming our way. Can't wait for this one. So cool for all my Christmas glitter projects!!! Thanks for sharing such a great tutorial!!! I really need that sticky embossing powder. I can see all the glitter now. There is so many awesome products being released. Thanks for giving us a sneak with a few and how to use them. (love your project too) I'm super excited about the Stickles Dry Glitter! I love me some glitter and use Stickles all the time so a win win for me!! Thanks for the chance to enter! Crossing everything I can cross, lol! I would LOVE to have some new toyz to play with before I can buy them. Oddly enough (or NOT!) all of these products are on my must have list for Aug! I'd love it if my number were pulled! St Pete, St Pete, St Pete. Sorry, couldn't resist! Sticky embossing what a great idea can not wait to play with that product and the new dry stickles, will just have to wait on doing some of my Christmas cards until I have these new fun products. Thanks for a chance to win. That is great. Thanks for trying it first and letting us know. Nancy P.
Love the card!! I'm not a glitter girl, but I may have to change my mind about that. Great card! I love the idea is using the sticky embossing powder with glitter. Thanks for sharing. Love what you did with these new products from Tim! Now I have to start my Christmas wish list a little early this year! Beautiful card and the sticky embossing powder is awesome. Thanks for the inspiration! I love,love,love the sticky embossing powder! It opens the door to many many techniques,thanks for showing us! Very cool. I hate the gluey mess when using glitter. I used Heat n Stick years ago with out much success. Can't wait to try Ranger's Sticky EP. Their products are wonderful! Such cool products. Thanks or the opportunity to win! Ok, that was amazing and it all goes on my wish list! Every time I think about trying other products, I am reminded how Ranger andInkssentials always seems toprovide what I really need/want. Thanks for sharing the goodness! great technique! Another must have for my shopping list. I love the card! I love what you did with the new products. I can't wait to get the new sticky embossing powder. Maybe I'll use some of the glitter and foil I've been hoarding. This is one prize that I would COVET! What a fabulous time you must have had at CHA as part of the Tim Holtz TEAM! That would be my dream job! Thanks for the opportunity to win! Oh that is so much better than glue. Looks like an awesome product! Thanks for testing it out! Well Ladies, First entry after CHA and it is a humdinger! Love the look of this card and Sticky Embossing Powder. Solves a lot of my issues. Will be using this on my Christmas tags. These are such great products...can't wait to try them...thanks for the great review! That is an awesome card!!! I can't wait to try all of the new products! wow, that looks like fun stuff. i love that it'll be avaialale for christmas this year. ugh, now i have to start thinking about designing my card. can't wait to see the other goodies that will be coming out. thanks for showing us. it must be loads of fun to go. The new products look amazing. Can hardly wait to see how they will be used next. Really, I thought I had seen it all! This stuff is amazing! I can't wait to get some. It will be a staple in my craft drawer for sure!! Loved seeing you in your new "home"! You fit right in! The new products are inspiring, and you present them in such special ways that I just love. Thanks for that! Thanks for the awesome tutorial! I was gaga the minute I saw the sticky embossing powder and am so happy to see how well it works!! TFS!! Awesome products and tutorial! Thanks for showing us these products. They're definitely a MUST HAVE. Oh I will be using these techniques on my future paper projects. Thank you so much, i never thought to use foil like that. Can't wait to try the new sticky embossing powder. The results look amazing! that looks like sooo much fun to play/create with! Sticky embossing powder plus added glitter??? Yes, please! I had not heard of these new products and now I really want to try them myself. I love your tutorials, so clear and understandable, keep doing more, I learn so much! Luv this. I have been following your blog for so long. So excited for your new Journey with Ranger and Tim!! OMGOSH! I LOVE GLITTER so much that anything that makes it stick so well is for me!! I LOVE IT! I really love the way it holds the silver on the star! LOVE IT LOVE IT LOVE IT!!! I love it and can hardly wait to try it out for myself and really want the big jar of rock candy oh my love the new products comming out. Thanks for the great project. Oh yes, I have a ton of powder, but this is brilliant. Amazing,and happy to see it! This will make my love-hate relationship with glitter perhaps not end in divorce! I cannot WAIT to get my hands on that Platinum glitter! It's a staple in my crafty life....like coffee. I really enjoyed your test drive, Paula. The new products are a great addition to these great companies' lines. Loved the glitter experience, no mess! And thanks for sliding in some older products that we may already own! That looks like amazing stuff !! Can't wait ! Awesome card and technique! Can't wait to try the new sticky embossing powder...and Stickles glitter??? WOWEEE!! Great looking card. So glad you are on Tim's team. Caught between his 12 tags of Christmas and your advent calendar...I'm soooo dizzy. Can't wait to try these products. Your demo makes the technique look so easy. You have just ROCKED MY WORLD! I am totally loving this and can't wait to play with these products! Wow...I had heard someone mention sticky embossing powder, and I thought, What? I already have a ton of embossing powders! But you have enlightened me. It goes on the wish list. (And if I win the blog candy...even better! )Your projects are beautiful! I specially love the star! Thanks for sharing! Thanks for the great informative demo in photo form. I get tired of watching YouTube videos after a while. This was clear and concise, and you definately sold me on this new product! Thanks for the chance to win! I've always steered away from glitter due to being covered in it on my first try. This embossing powder gives me a reason to try again! Thanks for the demo and the opportunity to win. Wow, you make such a great case that I totally **NEED** these products! That glitter is gorgeous and the sticky powder is awesome! Also, I love the shabby vintage cards, such a fantastic mix of fab elements! Sticky??? WOW I have to have the sticky embossing powder! Love using glitter on embellishments, sticky embossing powder looks like it would make it so much easier! What a wonderful assortment of tips for using the new sticky embossing powder! Cannot wait to get my hands on some. Wonderful project. I would love to win as I like embossing. OOH THIS STUFF HAS AMAZING POSSIBILITIES! LOVE TO WIN THIS! That looks so fun! Can't wait to get my hands on some! Love what you did with it too!! Love the sticky embossing powder. I really like how you used the glitter on the paper right away and it stays on. Sticky embossing powder, I can imagine what you can do with it. I love your project!!! Can't wait to see what else I have to buy! This is wonderful! I can think of several times I wanted to add something on top of an embossed element and couldn't figure out the best way to do it. So excited to try the sticky embossing powder--I agree it is a must-have to use with glitter, which I love but not the mess--seems super easy! Thanks for the chance to win! Love you girlies!! This is big, really big, Imagine the possibilities (hummm... who says that?) It's hard to glue ribbon and fabric without it showing through, I would love to see if the new sticky embossing powder would work. AAHHH, you have me dreaming of cool weather and sleigh bells! beautiful project! thanks for the chance to win! Beautiful! I love the vintage look and the sticky embossing powder sounds so easy to work with. Thanks for the contest (and for putting me in the mood for Christmas!). Thank´s for the demo of this great Sticky Powder. I can´t wait to try these new product. Thanks for the opportunity to win. Love what you've created. New products to play with, yes thank you. I love the idea! Another great product from Ranger! Love the new sticky powder - just in time for the holidays! OMG!! I cannot believe the cool new sticky powder. How do they come up with this stuff!? Would love to win. Looks like a neat product to try out! The embossing powder seems wonderful with less cleanup! I have purchased 2 different "embossing" sticky products that sucked….this looks like the answer to one of my prayers….YIPPY. Your card is STUNNING. I love your aesthetic so much…it just always hits me right in the center of my artistic heart. I cannot wait to get my hands on pretty much everything Tim is releasing in the next 6 months. I already pre-ordered like 6 Alterations dies…next to hit the preorder for Idea-logy I see is out on Nona Designs.com. Can't wait to see what else yo make using my favorite products. Congrats on your new "home" and your new job. What an exciting opportunity! Love the new Sticky Embossing Powder and the techniques you shared. Thank you! Glittering with virtually no mess?! Where do I sign up? I love the foil star too. Think about a fun Easter project with foil eggs or candy. Amazing. 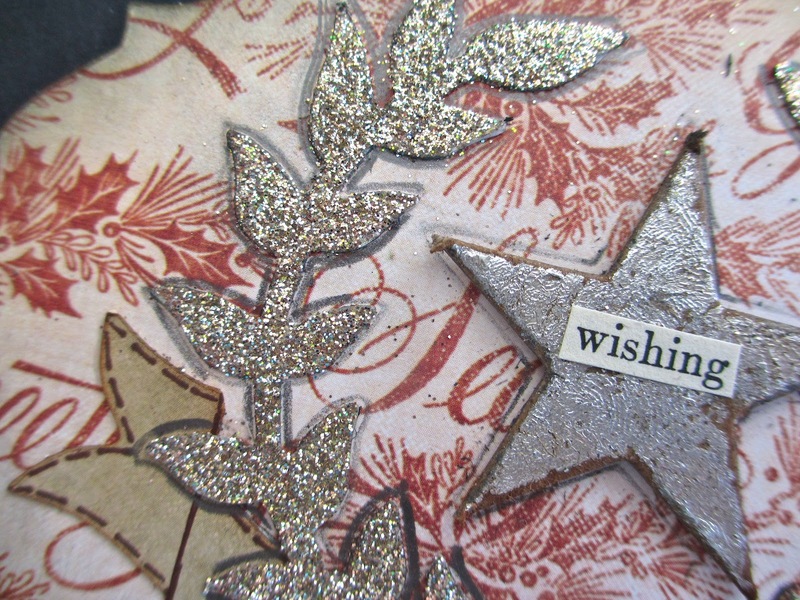 always looking for a way to add glitter with minumal mess...looks like sticky embossing powder may be the way to go! Gorgeous card! The new products always amaze me.